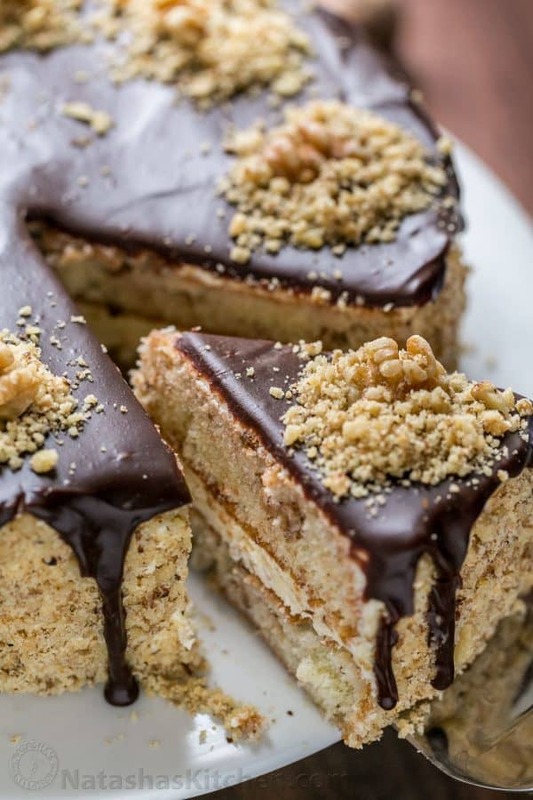 This Royal Walnut Cake is as pretty as it is irresistibly delicious! The Russian buttercream frosting made with sweetened condensed milk is tantalizingly good! Keep an eye on the whisk that mixes the cream – someone else will surely try to lick it! Ha! 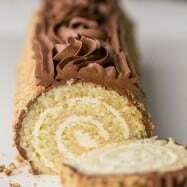 Truly it’s delicious and like no other buttercream you’ve tried before! 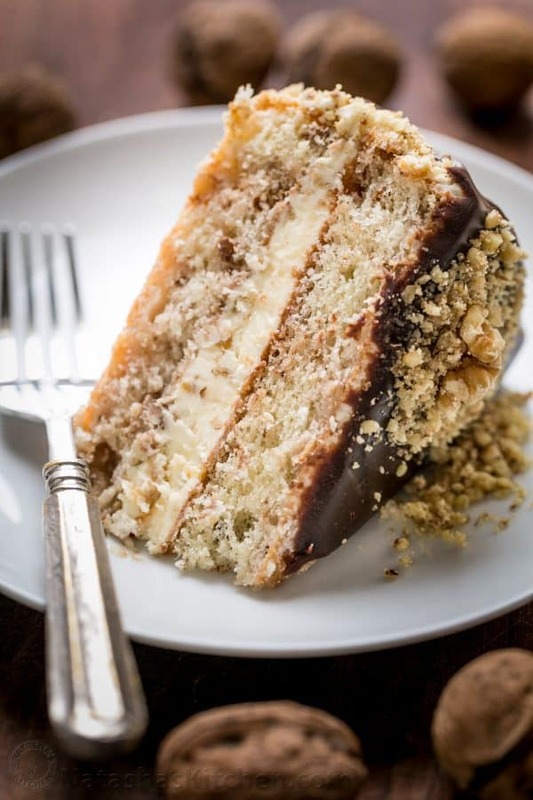 This recipe is sponsored by Fisher Nuts and the cake is loaded with toasted walnuts which infuse the cake with rich flavor. I kept the decorations simple so even if you’re not super skilled in the cake decor department, YOU CAN DO THIS!! Big thank you to our friends at Fisher Nuts for sponsoring this recipe – I trust Fisher brand because they don’t use preservatives and are non GMO project verified! Its the nuts and only nuts – just like you had popped them out of the shell yourself, minus all the effort and blisters. lol. You’ll recognize the right nuts by their bold blue “Fisher” brand bags. Since the frosting is a buttercream, it is best served at room temperature when the frosting is soft. 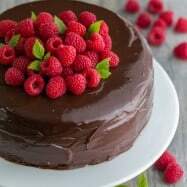 You can make this cake even 2 days in advance, cover and refrigerate and then bring to room temperature before serving. I have this same cake in the freezer (saving it for Christmas!) I just love make-ahead desserts and if you’re into that sort of thing, you’ll be surprised this dessert is also freezer friendly! Everything about this cake is good. Simple, but so good! I hope it makes your holiday’s more merry and bright! 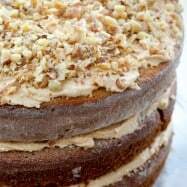 This Royal Walnut Cake is truly delicious and loaded with toasted walnuts from top to bottom. The Russian buttercream frosting made with sweetened condensed milk is tantalizingly good! Toast 2 cups walnuts on a dry skillet over medium/high heat until fragrant and golden (5 minutes), tossing often. Cool to room temperature then finely chop or pulse in food processor. Preheat oven to 350˚F. Line the bottoms of two 9" baking pans with parchment paper (do not grease the pan). In the bowl of a stand mixer fitted with whisk attachment, beat eggs for 1 minute until foam. With mixer on, add 1 cup sugar in a steady stream then beat on high speed 8 minutes. Batter will be fluffy and a thick ribbon will form when you lift up batter. Whisk together 1 cup flour and 1/2 tsp baking powder and sift it into the egg mixture in 3 increments. Gently fold in 1/4 of your cooled chopped nuts and divide batter evenly between 2 prepared pans. Bake right away in fully preheated oven at 350˚F for 23-28 min(I find it's perfect at 25 min). Let rest in the pans 5 min then run a thin spatula or knife around the edges of pan to loosen cake and transfer cakes to wire rack to cool completely to room temp. In a small sauce pan, off the heat, whisk together 2 egg yolks, 3/4 cup condensed milk, 1 Tbsp water, and 1/2 tsp vanilla until smooth. Place over low heat. Continue stirring frequently and stir constantly as it starts to thicken – DO NOT BOIL. When it’s ready, it will be the consistency of uncooked sweetened condensed milk. Total time on the stove: 5-7 minutes. Remove mixture from heat and let custard cool completely to room temp. It will thicken more as it cools. Beat softened butter in a mixer with whisk attachment for 5 minutes on high speed until white and fluffy, scraping down the bowl as needed. Add room temp custard mixture 1 heaping Tablespoon at a time, beating on high speed for a few seconds with each addition. Once all of the custard is incorporated, scrape down the bowl and beat another 2 minutes on high speed. Reserve 1 cup of cream and set aside (you'll use this to coat the top and sides of cake). Fold in 1/4 of your toasted cooled nuts into remaining big batch of cream. Line the edges of a cake platter with strips of parchment paper (this will make cleanup easier). Place first cake layer on the platter and spoon half of the syrup evenly over the top. Top with all of your walnut buttercream and spread evenly. Add the next cake layer and spoon the remaining syrup over the top. Coat the sides and top of the cake evenly with remaining 1 cup of buttercream. 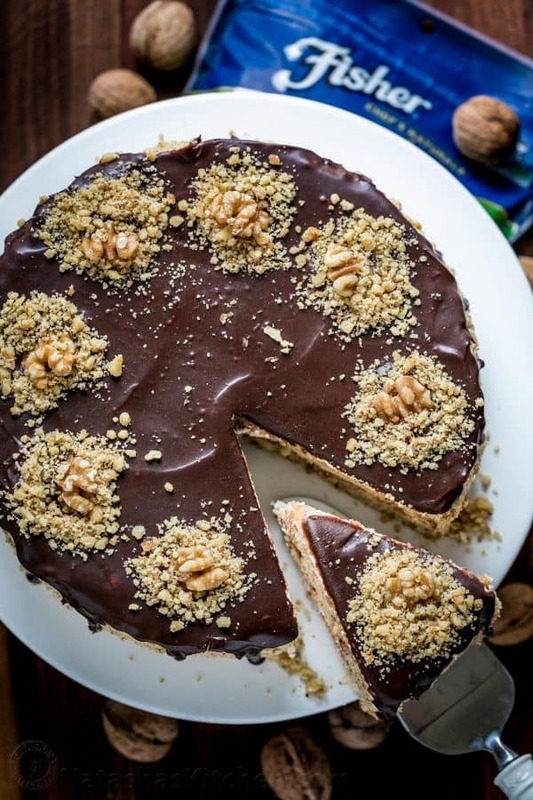 Apply the remaining finely chopped walnuts to the sides of the cake only, scooping it on with your hand and gently pressing for the nuts to adhere to the frosting. Now make your ganache (see below). Once ganache has rested 5-10 minutes, spread it evenly over the top of the cake, allowing some of it to drip down the sides of the cake. Let cake rest until ganache is set (you can refrigerate 30 min if desired). Place 1/4 lb of chocolate chips in a heat-proof bowl. Pour 1/2 cup heavy cream into a small saucepan and bring to a simmer. When it's just at a uniform simmer, pour over the chocolate chips ensuring chocolate is fully submerged in cream. Cover bowl with lid and let sit at room temp 15 min then whisk until a silky chocolate sauce forms. Let ganache rest 5-10 min to thicken slightly but still be loose enough to pour over the cake and drip down the sides. 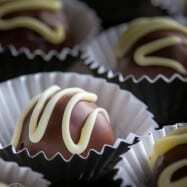 This is a sponsored conversation written by me on behalf of Fisher nuts. The opinions and text are all mine. 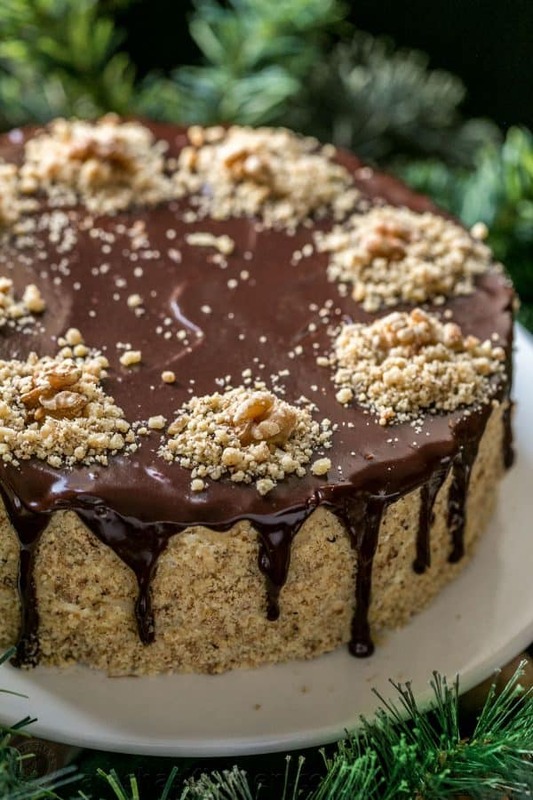 Check out all of the Fisher Nuts recipes for more beautiful holiday inspiration!! We are all about generous slices! I hope you and your family love this Royal Walnut Cake! 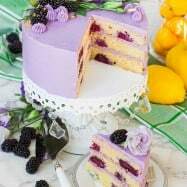 The flavors on this cake are amazing. Is there a way of turning this recipe into cupcakes? The cream and ganache would work perfectly. But do you have a solution for making the cake a bit more dense? Question, this was a practice run for my son’s first birthday. For the actual birthday I want to decorate it with some colours can the Russian icing be piped to look like grass so I can place some safari anamial in it ?? Any suggestions ?? Hello, I loved the cake! It was so good. You mentioned that you can freeze it. Do you freeze it with the ganache on top? I never used a cake syrup before. do you have to put that in the recipe? could I make the cake without it? I don’t have walnuts, but have a plenty of pecans. Do you think I can substitute? Usually it works, like in carrot cake. Quick question, could I cut the 2 cake(biskvit) layers in half to make 4 and put frosting in between each or would I not have enough frosting? Oh I’m so glad to hear that!! And the idea of adding crushed graham crackers is brilliant! Happy 2017 to you and your family! Thank you for your quick reply. Merry Christmas to you guys. ⅔ cup condensed milk and 4 oz semi-sweet chocolate, chopped. Stir condensed milk and chocolate in a pot over medium-low heat until melted and shiny. I haven’t used it yet, but I will give it a try for sure. You have done a good recipe that I likes , can I taste it? cant wait !! hope to read Your next Post. How long will it last pre-assembled in the freezer? Do you simply put it in a large enough tupperware?